The Bungo province in Kyushu produced such excellent sword-smiths as Yukihira in the Koto times. The Bungo Takada school was founded by Tomoyuki in the Nanbokucho period. Tomoyuki is considered to have been a superior sword-smith. With the passage of time it is generally felt that the quality and style declined and by the Muromachi period all of the works were pretty much the same. Members of this school are also known as Fuijwara Takada because they used Fujiwara as a family name in their signatures. There are different schools of thought on the quality of Bungo works made in the Shinto period. An immediate response from many “sword experts” when Bungo works are mentioned is that they are not swords of great quality. Others feel that they are good swords. 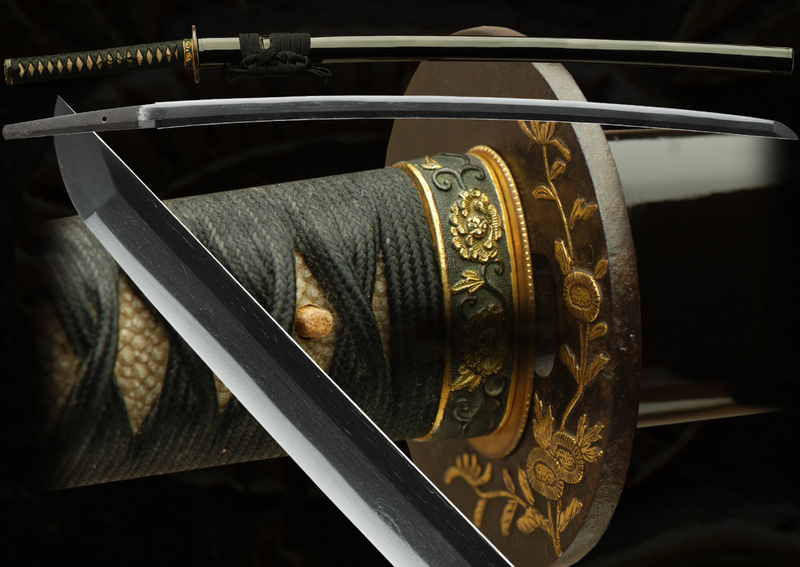 Perhaps a foundation of this difference of opinion is that if you look at the structure of Bungo Takada swords, you will see that they were made to satisfy practical rather than artistic needs. Indeed, at times they were sought out because of their cutting ability and sturdiness. It is said that the founder of Bungo Takada school was Tomomitsu or Tomoyuki. Takada Swordsmiths in Shinto age engrave the last name “Fujiwara”, and so they are called also Fujiwara Takada. The neighbor of the Takada school was Hizen school. 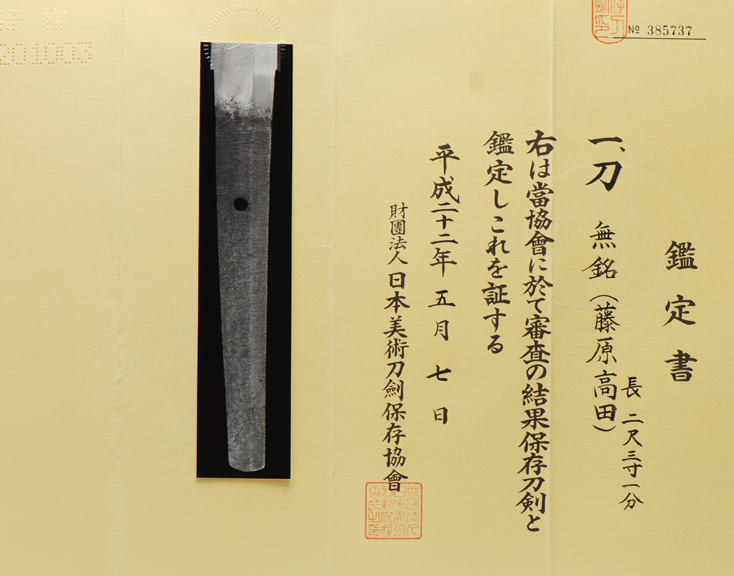 Hizen sword makers were controlled by Nabeshima daimyo and imported western steel. Takada school made swords that cut well. Early stage from late Muromachi to Kanbun era, Takada school swords were prized highly for cutting very well and for good sound jigane. This sword is very beautiful and well made showing the true quality made by the takada smiths. The sword is forged ko-itame which reminds one of the Hizen hada. The hada is course in places has in many koto era swords. There is much ji-nie with a brilliant moist misty quality to it. 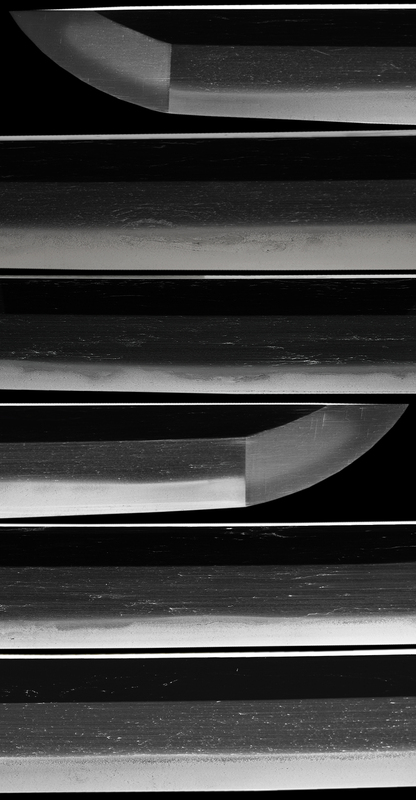 The hamon is a thick undulating sugu-ha with a perception of depth when viewed properly. The Koshirae is stunning with Peony motif finished in shakudo and gold. The saya is a black lacquer with a purplish hue from speckles formed in suspension and black ito and black sageo to finish. The sword is a longish 27+” and is attributed to fujiwara takeda from the koto period mounted in shirasaya and koshirae. A great package papered and polished and ready for the collector. For a few days only……..
Email us if your interested in this item and remember to include the order number for this item: fss-771. The above item, as a result of a shinsa at this organization, has been designated a HOZON T�KEN, and is confirmed as being authentic.